Since I’ve been focused on Slack as a technology tool in my online course, I’ll reflect on how this came to be and why I think I’ll continue to explore the use of this tech tool in my teaching practice. Before I begin, it’ll be helpful to know – What is Slack? I’ve been a Slack user for a variety of purposes with the most active Slack communities being the Creative Commons slack, the Virtually Connecting space, and the CLMOOC slack space. For me, it’s a one stop shop where a channel holds a running conversation about a topic, event or issue relevant to the individuals in that channel. We can ‘pin’ items, share links, have threaded conversations (in an LMS style), and just tinker around with fun stuff together. It’s where running conversations happen without you but you can go back and read so you never have to experience Fear of Missing Out (FOMO). Since these are in unique channels, the conversations are focused on the topics of interest. I don’t need to be in every channel and I can start private channels or even private direct message chains to talk about issues, ideas or questions. My personal experiences prompted a few questions. What if the learning management system could be more like Slack? Why can’t learners have fun slacking around with each other while learning happens? I became aware of other higher education instructors who were trying Slack in their learning contexts, so I jumped. I reached out and talked to two that had already tried Slack for course work. 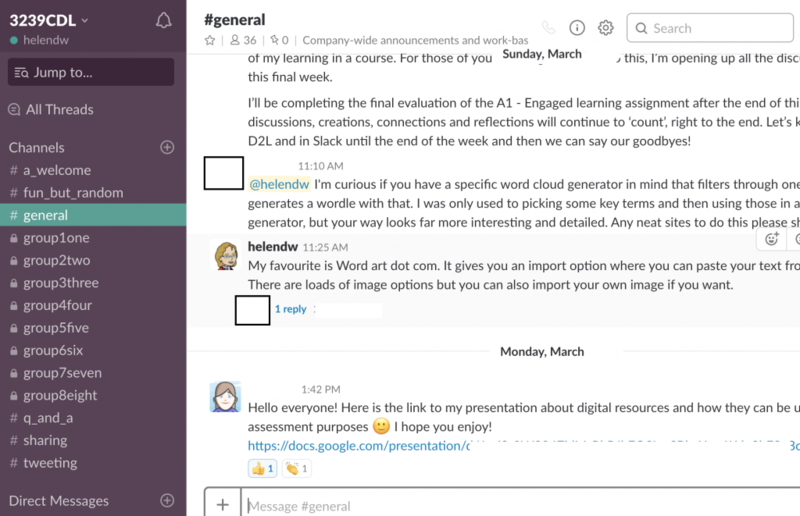 With the support of Steven Secord, we were able to discuss the pros and cons, build an early version of Slack for the online course we were teaching, and managed to get students acclimatized to this new tool. Some were whole-heartedly involved but others stayed away from using Slack. At the end of the course I asked for anonymous feedback to help with decisions and improvements. I was able to iterate and redesign based on this student feedback from the first try. This time I set up private, small group spaces to minimize the ‘noise’ when everyone is sharing with everyone – this can get overwhelming in the LMS and even more so in whole group spaces in Slack. These private small group spaces were structured based on student responses on their pre-course surveys as well as choices which I invited students to submit to me as a DM in Slack. The instantaneous nature of the direct messaging (DM) is a distinct advantages for using this tool. The formal LMS structures are not as responsive or immediate as those evident in Slack, with emoji’s and Twitter integration being two ways to gain attention and engage students with fun and learning on the go. After the second year of using Slack as a digital tool to support student learning, I’ve decided to continue using this tool for at least one more year, primarily based on student feedback. It still creates some issues with having two spaces in which to communicate learning – the LMS and Slack. With providing distinct purpose for each digital tool, I hope to clarify usage. The LMS is for discussion. Slack is for conversation. The LMS is for weekly posts and academic thought. Slack is for quick chats, sharing interesting links, and getting feedback from peers on your assignments. The LMS is formal writing with proper grammatical structures and well thought out responses. Slack is for street talk, emojis, quick contact and responsive support. Because Slack is a new tool for the majority of the students, it puts them on an equal level as users of this technology. This connects directly to course outcomes and prompts some deeper thinking when we explore the critical digital literacies throughout the course. Students can reflect on their own experiences when entering, accessing and navigating in Slack as a mirror for the integration of digital tools into their own teaching practice. I’ll continue to seek feedback, provide strategic support and build critical digital literacies in action as I teach students not ‘how’ to use technologies, but ‘why’ to use them in their teaching.